With the beautiful summer weather we’ve been having, my husband has been outside grilling food on a very regular basis. And today’s recipe for Moroccan Spiced Shrimp Over Garbanzo Bean Salad was actually inspired by 5 years old who LOVES shrimp! On a recent beach excursion, we stopped to have lunch at a local, seaside restaurant, and my daughter was begging to order anything with shrimp. We opted to get her this dish, and she absolutely loved it. I tried my best to replicate the version from the restaurant, and I’m pretty pleased with the results…it turned out delicious and very light at just 4 Smart Points per serving. Of course, the final approval came from the harshest critic, my little girl herself, and she vehemently approved. So if you are looking for a new grilling recipe to try this summer, get this one on your menu ASAP! 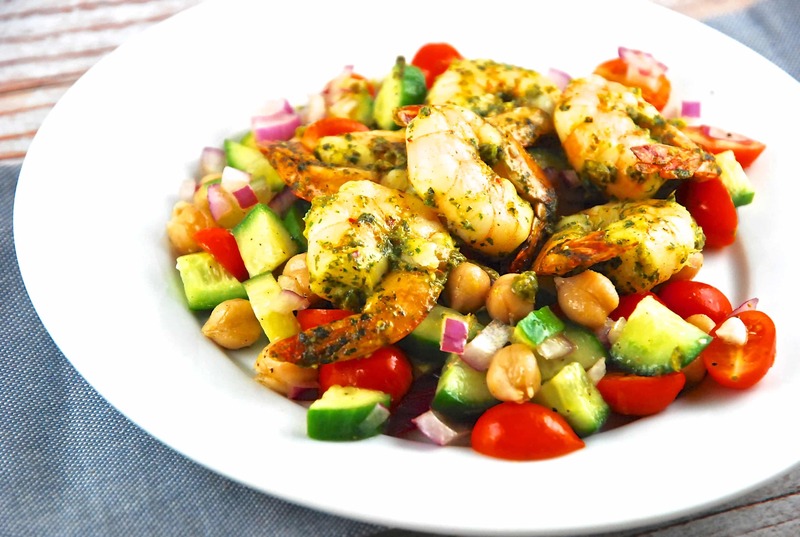 Light and flavorful, yet very filling, this shrimp dish is an absolute winner. Perfect for an easy weekend lunch or brunch, or light dinner. Combine all ingredients, except the shrimp in a food processor or blender, and puree until well combined. Toss the marinade with shrimp in a large bowl, cover, and let sit about 30 minutes. Grill shrimp on medium high heat, until cooked through, about 2-3 minutes on each side. Combine the salad ingredients together and toss to coat. Divide salad and shrimp evenly among four plates and serve immediately.